Corals consume microplastics! Talk about an unhealthy diet! 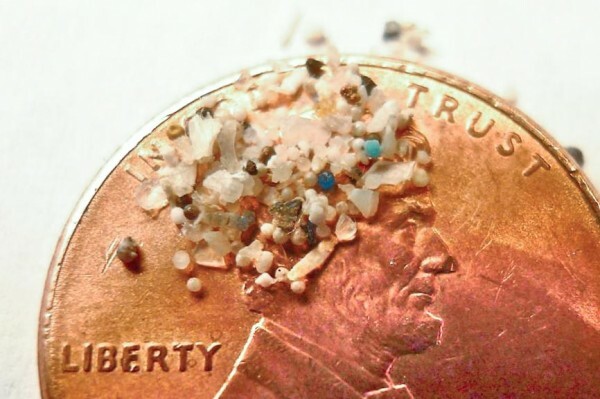 Microplastics are very small (<5 mm in diameter) and they are everywhere (Fig. 1)! They are a source of contamination in marine ecosystems around the world. Microplastics enter the marine environment in a number of ways, including through the breakdown of larger plastic items (clothing, plastic bottles, marker buoys, etc.) and in the effluent from water treatment plants (which do not catch the tiny microbeads in exfoliants, hand soaps, and cosmetics). These contaminants are harmful to marine organisms. They can block digestive tracts and cause cellular and tissue damage in organisms that mistake them for food. For example, microplastics have been found embedded in the gastrointestinal tracts of some fish and in both the GI and respiratory tracts of crustaceans. These tiny plastics also adsorb and transport contaminants such as heavy metals and pollutants. The pollutants and the plastics have long residence times in the environment and when consumed, they can bioaccumulate as they make their way up the food chain to top consumers, including humans. The effects of microplastics can be vary by species, type of plastic, and other factors Therefore, more research is necessary to identify which organisms are most vulnerable. Corals are important animals that create structures that provide habitat for thousands of other species. While corals do have symbiotic algae that provide them with energy, many supplement that diet by actively feeding on bacteria and plankton. For some coral species, their consumption of other organisms accounts for more than half of their energy intake. Is it possible that they are also feeding on microplastics? Hall et al. set out to quantify microplastics in Great Barrier Reef waters and to see whether corals can capture and ingest them. They conducted plankton tows (dragging finely meshed nets behind a slowly moving boat) to catch microplastics. 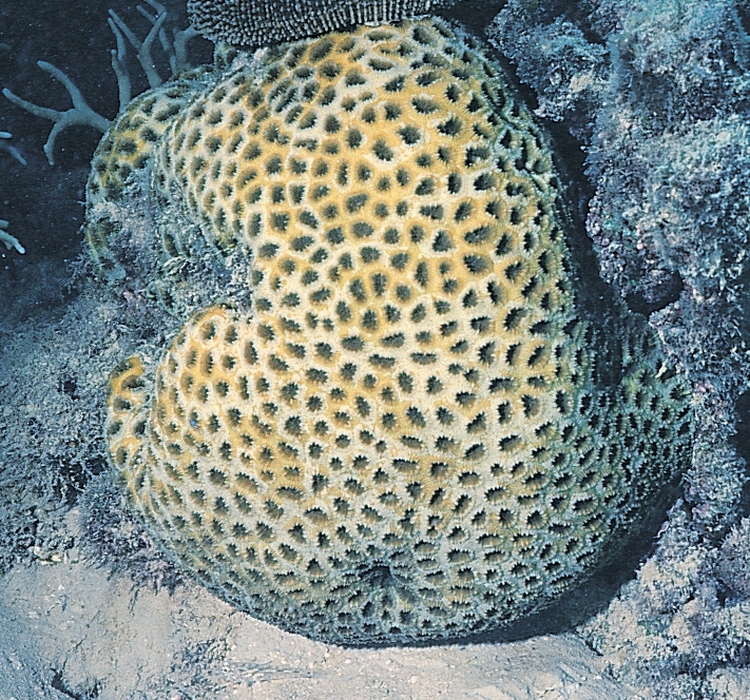 In the lab, they focused on the mound-shaped reef-building coral Dipsastrea pallida (Fig. 2). They kept corals in tanks with blue polypropylene plastic beads to determine ingestion and feeding rate of corals. Fig. 3. Microplastics in the mouth (a) and mesentery (b) of coral polyps. Plastic fragments (c) from reef waters captured in plankton tows. Microplastics are indeed present in reef waters (Fig. 3c). Tows captured up to 2 particles per 11,000 L of seawater, a relatively low concentration. However, it is likely an underestimate since they could not trap the smallest particle sizes. Most particles found were polyurethane, polystyrene, and polyester, which are found in fishing floats and marine paints. Most were fibrous indicating they are likely fragments created as larger items break down. Corals can and do ingest microplastics! Microplastics (100 μm-2 mm in size) were found in coral polyps’ mouths, but most were tangled in mesenterial tissue—a membranous layer within the stomach cavity (Fig. 3a,b). These tissues are responsible for the majority of digestion; therefore, digestion may be negatively affected by microplastics. These particles were retained in the corals’ guts for at least 24 hours. Microplastics were also observed stuck to the mucus covering of coral tissues before ingestion. In feeding trials, the corals ingested plastics at rates comparable to those for consuming plankton and suspended particulate matter (between 1.2 and 55 μg cm-2 h-1). Most coral polyps that ingested plastic only ingested one particle, which represents a lower feeding capacity compared to plankton consumption. It is therefore possible that microplastic consumption does inhibit feeding. This study is the first to document coral ingestion of microplastics. There are many more questions to be explored, several of which are highlighted by the authors. For example, when given both plankton and microplastics, do corals still consume plastic? What if the plastic is biofouled or has adsorbed pollutants? (In Hall et al.’s study, the plastic was clean). The authors specifically suggest looking at how microplastic consumption may change coral ingestion of plankton, coral growth and reef-building capacity. If microplastic ingestion is diminishing any of these processes, it could affect the health of the greater ecosystem. In addition, they remind scientists that we need to examine how these microplastics could affect physiology, growth, and survival or many other marine species. This seems to be a growing field of research, so I am sure more will be forthcoming. -Be a conscious consumer! For example, switch to bars of soap, cosmetics, and personal care products free of microbeads. The good news is that several companies are committing to phasing them out over the next few years. Several states are considering bans, and there is federal legislation under consideration (The Microbead-Free Waters Act). With all of these efforts, hopefully finding microbead-free products will get easier! Also pay attention to what your clothing is made of and buy materials that will not break down into microplastics. -Don’t litter! 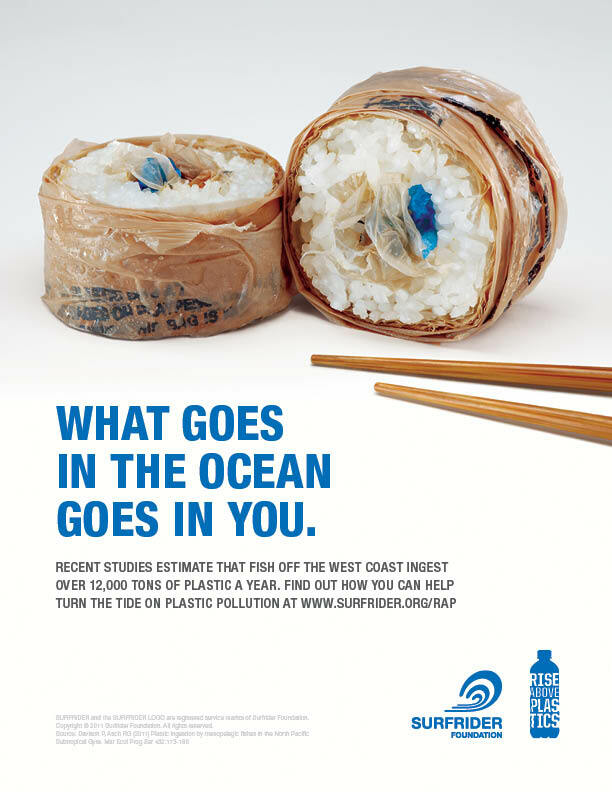 If you see plastic litter, pick it up and dispose of it. -Ditch the bottled water and carry a reusable water bottle. -Use glass food containers and reusable fabric lunch bags to transport your food between school/work and home. If you liked this article, search our archives for more about microplastics! Fig. 5. 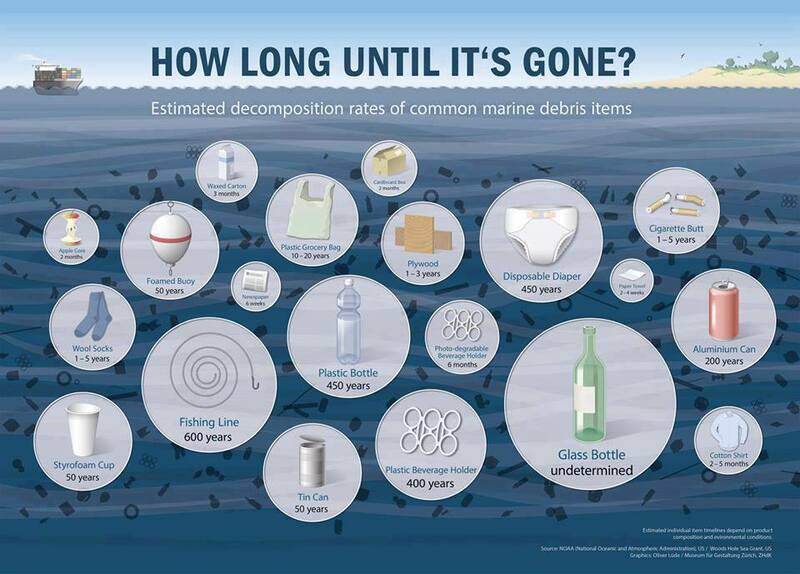 Talk about long residence times… Many of these items will “live” longer than we will. I am a graduate of the University of Notre Dame (B.S.) and the University of Rhode Island (M.S.). I now work in southwest Florida, contributing to the management of an estuary. I am fascinated by the wonders of nature, the land-sea interface, ecology and human disturbance (and solutions!). On a personal level, I am a chocoholic, love to travel and be outside, and relax by reading or spending time with my emotionally needy dogs!